Maintaining shrubs and hedges in good shape, healthy and dense isn’t an easy task especially if one doesn’t have the skills, know-how and tools to do the work. You don’t have to worry about the condition of your hedgerows any more. With our professional help you can keep the bushes in your property well shapes and neat. Overgrown shrubberies not only look neglected and unsightly, but also can make pavements and roads dangerous. We can offer you highly reliable hedge trimming in and near Bethnal Green done according to your needs. Our gardeners have the necessary knowledge, skills and trimming tools to ensure effective and professional work. They are supplied with sharp pruners, shears, electric hedge trimmers, wear protective gloves, glasses and uniforms. We can make your hedgerows in a straight and oval shape. Our gardeners will reduce the size of the shrubs keeping them dense at the bottom and narrower at the top to make sure enough sunlight penetrates and reaches all leaves. 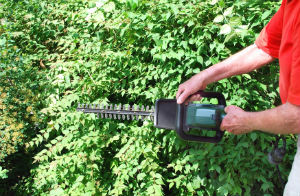 Use our effective hedge trimming services available in E2 during all weekdays, weekends and holidays. Maintaining your bushes and hedgerows properly cut is important for the health of the plants. By trimming them whenever it is necessary using the services of experienced gardeners you will have dense, compact and fresh hedges. Our gardening experts can make your hedgerows presentable, shaped and grow healthy. We offer all kinds of other gardening services such us lawn mowing, garden clearance, turfing, mulching, watering, making flower beds. Our gardeners will carry out the hedge trimming at the most appropriate time during the spring or summer to achieve best results. 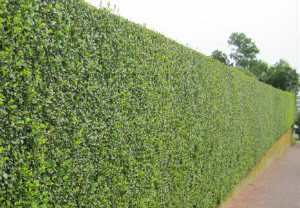 Take advantage of our hedge trimming services which we provide in Bethnal Green at competitive prices.